The Buccaneers equaled the best start in franchise history by winning their fifth straight game despite losing in most statistical categories. 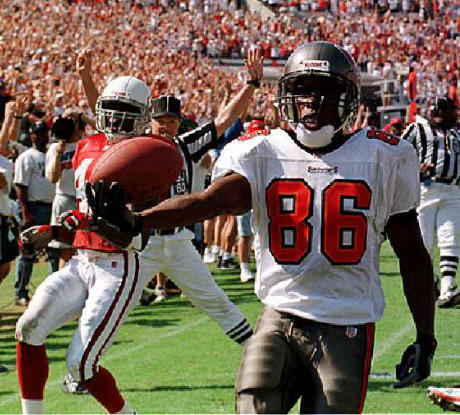 Tampa Bay was outgained 364 to 147 total yards, but managed to sack QB Kent Graham six times (three by DT Brad Culpepper) and intercept two of his passes. The Tampa special teams opened the scoring when Alshermond Singleton blocked a punt and recovered it for his own score. The Cardinals did have a late chance but Kevin Butler missed a 47-yard fieldgoal attempt. INDIVIDUAL STATISTICS RUSHING BUCS: Alstott 8-27, Dunn 10-27, Dilfer 2-0. CARDINALS: McElroy 13-40, Johnson 5-21, Centers 4-4, McKinnon 1-3, Graham 1-2, Swann 1-0. PASSING BUCS: Dilfer 24-12-110-1-2, Barnhardt 1-1-25-0-0. CARDINALS: Graham 52-31-339-2-1. RECEIVING BUCS: Anthony 5-49, Harris 3-10, Dunn 2-10, Williams 1-31, Bouie 1-25, Copeland 1-10. CARDINALS: Moore 8-147, Centers 8-58, Sanders 5-60, Edwards 3-27, Williams 2-15, McElroy 2-11, Gedney 1-17, Carter 1-4, Johnson 1-0. INTERCEPTIONS BUCS: Abraham 1-0, Lynch 1-0. CARDINALS: Williams 1-42. KICK RETURNS BUCS: Williams 2-43, Dunn 1-30. CARDINALS: Williams 2-46. PUNT RETURNS BUCS: Williams 4-57. CARDINALS: Williams 2-21. SACKS BUCS: Culpepper 3-19, Ahanotu 2-21, Sapp 1-5. CARDINALS: Swann 2-12, Smith 1-10.